You have probably seen a deer jumping. Could be a rock or anything, just jumping. But How High Can A Deer Jump ? Knowing how high a deer can jump is very important. When you are a deer hunter, you want to understand the movements of a deer, one of which is how high it can jump. You also could be thinking of planting a fence to keep off deer and hunters from your ranch. If you are a deer farmer, your goal is to make sure that your animals remain within your fields. 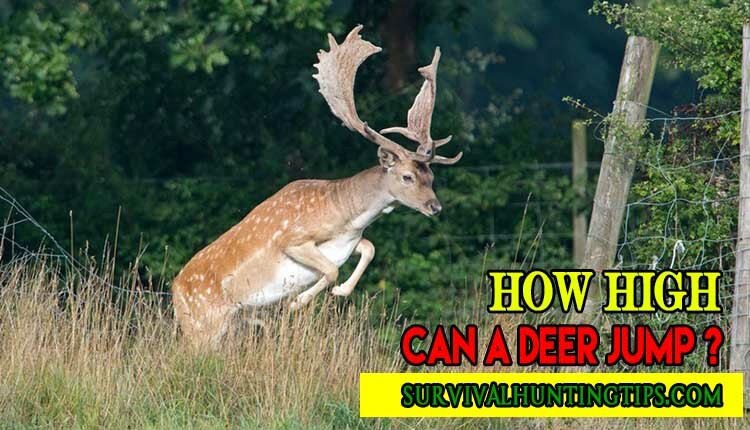 How To Find The Best Deer Hunting Arrows? What will determine the height of your wall is how high the deer you’re protecting can jump. #4 What Happens If It Jumps Too High? Deer are as good in jumping as they are in running. How High Can A Deer Jump ? Most deer can easily clear a 6-foot fence without much effort. Current records from the US Department of Agriculture indicate that a whitetail deer,which is the common one in North America can jump up to 15 feet, though in rare cases. Some sources indicate that deer can jump between 6 and 12-foot depending on the motive. They are more like us. You can’t jump off a 3-story building on a normal day but you would if it were burning. That does not make you a good jumper. As such, if you are determined to wholly curb their jumping, try harder. While deer can jump that high, it is not their default behavior. Deer do not jump over a fence or a barricade simply because it is planted in their way. Hardly will you see a deer without a reason. While whitetail, black tail, and other deer species can right as high as 15ft, they tend to avoid jumping unless it is very necessary. I’m yet to taste deer’s meet but I bet they are probably delicious. Deer are hunted both by humans and other animals. When the deer are on the run from a predator, your fence won’t do much to stop her. This is what I have witnessed on National Geographic and the few adventures that I have pursued. They know humans can be mean. Most of the walls that have been installed in ranches across the US are to keep crops and other types of plants from deer. These animals don’t want to starve their cuteness. Coyotes and dogs are among the animals that make deer jump as high as 12ft. The next time you find them intruding your ranches, they were probably hungry and Walmart was too far. If it’s not for food, then its love. Animals aren’t that different from us. Male deer have this hormone that won’t allow them to settle when they see a female deer over your fence. His price is to jump and the next moment, he’ll be over your fence for the prize. After knowing How High Can A Deer Jump , you want to know if they all jump the same. All deer can jump they can’t jump the same way. This is the reason farmers have planted different heights for their fences. The height they jump is normally determined by their age and risk. Adult deer normally jump higher than younger deer, perhaps because of experience. Also, you might find a deer jumping higher in times of danger than it would when searching for food. Although deer can jump as high as 12-feet, it does not always happen. I have witnessed a deer on a country road struggling to jump a 7ft fence. What deer do when they can’t jump a high want has got to do with their eyesight. These animals are not good at seeing. They hardly see how tall a fence is, especially a 6ft or an 8ft one. If it is unable to climb the fence, they do not try several rounds, they simply relent and ran away. This is why a good fence would work magic in keeping deer off your ranch. Now you know How High Can A Deer Jump and you want to plant a fence that achieves your objective perfectly. There are some considerations that are imperative. How many deer are within your area? Do they have sources of food? As I noted earlier, deer only runs for food or security in most cases. First of all, you don’t have to spend of a high wall because you saw a deer on your ranch. It could have been a stray deer that latter resumed to its reserve. Also, by planting a high fence in an area where they are unlikely to find food, you are only intentionally starving the poor animals. You want to make sure that they have alternative sources of food before locking them out of your field. About love, leave it to them. They can work it out better. Planting the fence can be an exhausting process but it’s always worth it. When installing the fence, you want to make sure that it will meet your objective Most deer will jump as high as 6ft and few manage 8ft let alone 12 ft. An 8ft fence is relatively high enough to keep away most whitetail deer that have been into your ranch. If you are looking for a Guantanamo-kind fence, then I would suggest a 12-foot fence. All you need to know is that it will cost you a lot more but it will not have much value to you. However, these animals can be strange at days. Don’t be shocked to find them over your 8-foot fence for your plants. To make you fence more effective, you want it to lean outside a little bit. You also want a fence that and can last for some years before asking for a replacement. In that case, the wooden fence is not a great choice as a steel hex grid fence is. The latter normally consists polypropylene with monofilament and can serve you for generations before you can think of replacements. How High Can A Deer Jump ? You already know. It is a fact that deer can jump pretty high. If you planning for some hunting, you might want to think of how to ease your work, especially where the animals have to jump. At the same, deer fencing is not always necessary unless the animals make serious loses to your ranch yet they can alternative sources of food. If it is not the case, perhaps a short ceremonial fence would serve to benefit both of you.